This week is all about React Native! Below you'll find some super-useful RN components and widgets including forms, chat, and infinite scrollers. A cool thing about RN is that it's expanding even beyond mobile into the desktop (and even back to the web, oddly enough). Below you'll find out about react-native-desktop, which is a project to bring RN to Mac OS X Desktop apps. The self-proclaimed "best Swiper component" for React Native. From web to native to back again: react-web is a framework for building web apps with React Native compatible API. Batteries-included Form component for React-Native. It has the basics like text inputs and text areas, but also more sophisticated components like Date Pickers, Loading, and Modals. Tabbed navigation that you can swipe between, each tab can have its own ScrollView and maintain its own scroll position between swipes. Pleasantly animated. A pull-to-refresh ListView. It shows a loading spinner while your data reloads. 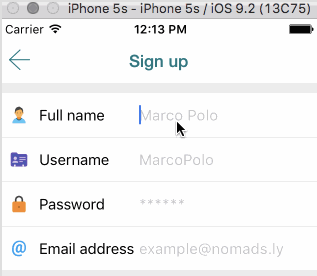 Another great pull-to-refresh is react-native-gifted-listview. react-native-gifted-listview also supports infinite scroll. Build OS X desktop apps using React Native!